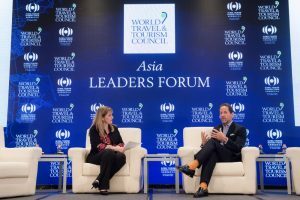 Macao (Macao SAR) – October 24, 2018 (travelindex.com) – The World Travel & Tourism Council (WTTC) convened its Asia Leaders Forum in Macao, SAR, in which 150 CEOs, government representatives and regional leaders assembled to discuss critical issues facing the region’s travel sector. The agenda was packed with all the big issues: sustainable tourism, airport biometrics, emerging traveller trends, and even a bridge. A historical overview of Macau’s tourism sector was provided by Maria Helena de Senna Fernandes, Director, Macau Government Tourism Office. Once a merchant port, Macau was never truly competitive in the manufacturing sector and so turned to tourism as an alternative path to development. Once gaming was liberalised in 2004, tourism began to boom and now nearly half of all jobs in Macau are in the sector. Hotel rooms have also grown exponentially from 9,500 in 1999 to 39,000 last year. All of this growth and prosperity means that by 2020, Macau is expected to overtake Qatar as the richest place on Earth. Glenn Maguire, Principal Asia-Pacific Economist, Visa, enlightened the Forum on emerging trends in Asia. He reports that everyday in Asia, 11,000 people are added to the labour force; 1,000 industrial robots added to productive capacity; 120,000 people move from rural areas to live in cities; 372,000 people access the internet for the very first time; and 353,000 join a new social network. We are increasingly influenced by trends when we select our next holiday destination. Glenn Maguire announced that the next big travel destination, according to forecasts, is Girona, Catalonia, featured in HBO epic Game of Thrones as the fantastical and fictional city of King’s Landing. As a result of this feature, Girona has experienced high levels of growth as a travel destination, attracted high volumes of tourist arrivals, and had these growth rates sustained across four consecutive quarters. WTTC’s Cities Report 2018 was launched at the Forum, analysing the economic impact of Travel & Tourism on 72 cities worldwide. Of particular note, the Report showcases the dominance of Chinese cities in the sector. Four of the five fastest growing cities over the past ten years are located in China: Chongqing, Chengdu, Shanghai, and Guangzhou. In fact, Shanghai is ranked as the largest city by volume in 2017, and by 2027 is expected to be double the size of Paris in terms of sector contribution to GDP. It was revealed that as younger people continue to spend more of their money on experiences rather than goods, travel habits have become increasingly spontaneous, meaning more last-minute short-haul trips. Further, James Riley, Group Chief Executive, Mandarin Oriental Hotel Group, shared that millennials are generally not targeting luxury brands when they travel, instead opting for ‘more daring’ destinations and set-ups. Anita Mediratta, Founder & President, CACHET Consulting, added that millennial isn’t a demographic but a mindset that tourists of all ages can adopt, meaning that millennial travel trends are not necessarily confined to younger generations. Hosted on the eve of the Hong Kong-Zhuhai-Macau Bridge’s opening, the Asia Leaders Forum became a platform on which to discuss the bridge’s completion and opportunities. James Tong, Director of Public Affairs, John Swire & Sons, detailed the decade-long journey of making the case for a bridge and then constructing it. The Bridge is now the world’s largest sea crossing stretching 39km (55 miles). Tong described it not only as ‘an important piece of infrastructure’ but also a ‘commercial and social initiative’ that will connect 100 million people in the Greater Bay Area and enrich the region. 7. Could airport technology spell the end of passports? Biometrics has become a huge topic of discussion in Travel & Tourism, with airports, governments, travel and tech companies across the globe investing in new methods of processing passengers. Jane Sun, CEO, Ctrip, presented a framework for how the traveller journey could be streamlined so that formal documentation is no longer needed for passengers to get from A to B.
WTTC’s Buenos Aires Declaration, now with 107 CEO signatories, commits the Travel & Tourism sector to ending illegal wildlife trade. One of those signatories, Hamish Keith, CEO, Exo Travel, advocated that the sector go beyond this Declaration to cut illegal wildlife trade out of supply chains and engage in more standard-setting so that sustainability is at the centre of everything each travel company and authority does. Jane Sun, CEO, Ctrip, outlined a plethora of ways that travel companies can assist their customers during crises, ensuring that they are prepared for and can manage emergencies. Sun detailed how important translation services, emergency transfers, and medical provisions are to tourists in crises. Companies also play a role in reissuing misplaced documents and recovering lost items. World Travel & Tourism Council (WTTC) is the body which represents the Travel & Tourism private sector globally. Members consist of CEOs of the world’s Travel & Tourism companies, destinations, and industry organisations engaging with Travel & Tourism. WTTC has a history of 25 years of research to quantify the economic impact of T&T in 185 countries. Travel & Tourism is a key driver for investment and economic growth globally. The sector contributes US$8.3 trillion or 10.4% of global GDP, and accounts for 313 million jobs or one in ten of all jobs on the planet. For over 25 years, WTTC has been the voice of this industry globally. Members are the Chairs, Presidents and Chief Executives of the world’s leading, private sector Travel & Tourism businesses, who bring specialist knowledge to guide government policy and decision-making and raise awareness of the importance of the sector. WTTC’s annual Global Summit brings together over 800 delegates to discuss the opportunities, challenges and issues facing the industry, while its Tourism for Tomorrow Awards recognise the industry’s power to be a positive force in sustainability.